Hey guys! 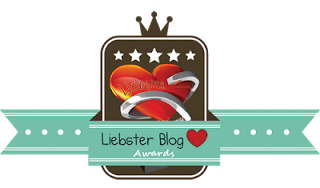 I've been nominated for a Liebster Blog Award by +K. Nowinsky! First things first, I want to thank her for thinking of me. :) Honestly, I had no idea what this was but it's pretty cool. It's a great way to find blogs and promote your own. 1. I danced half time at a New York Knicks game in 2005. 2. I am obsessed with all things supernatural (duh!). 3. I can't walk into Barnes and Noble without buying something. I was there Sunday and my boyfriend literally had to usher me out. I still bought one thing. 4. I have the best dog, Beau in the entire world. He sleeps in bed with me and is truly my love. 5. I don't like chocolate much. I know, I'm such a loser! 6. I go camping at least once a year. 7. My favorite state is Vermont and I go there at least twice a year. Wilmington is where it's at. 8. I'm a huge people watcher. 9. I graduate from college in the fall and will have an early childhood teaching degree. 10. My real hair color is blonde- right now it's reddish brown and before that it was pink. I have hair ADD. 11. I truly read and love every person who supports me. I am on this every single day and respond to every single comment. I am dedicated to my book and will do anything to see it succeed. Honestly, I have no idea how to answer this. I could watch the Hunger Games over and over again. I think they did a great job with that movie. I tend to favor comedies so classics and new movies are on my list. The Hangover- classic. Pitch Perfect- loved it. As for all time favorite... Might have to be The Watch. However, tomorrow it may be different. I'm in a silly mood. 2. If you could go anywhere, where would it be? I really want to go to Australia. The atmosphere, location, really everything about it appeals to me. I hate flying though so I doubt I will ever have the balls to venture down there. I'm going to Spain this month so we'll see how I do there. 3. How often are you online and how long? I have an iphone, mac and computer at work. I am constantly online. I like being on as much as possible. I think having a strong social networking presence helps to get your name out there. You can't just reply thanks, it needs to be personalized so I'm constantly on responding and replying. How long? I don't know, collectively 3 to 5 hours a day. Maybe? 4. What is your favorite sport to play or watch or both? 5. If you could change one thing about your life, what would it be and why? I don't regret a single thing in my life thus far and I don't plan on it. I think life is way to short to think what if and wonder what would happen if something changed. I don't go around screaming YOLO and doing stupid stuff but I don't look back and wish things were different. I follow the saying, everything happens for a reason. If I changed something from my past, I wouldn't be where I am today. 7. When was the last time you donated to a charity? Does donating time count? If so I do a lot for my church. I am highly involved and spend a lot of time there. On Friday I visit a food pantry and give them bread and various things that they need. I don't have the money to spare but when I can I like to be involved in the community. 8. Have you ever ridden the subway or mass transit? Where and why? Of course I have. I like near New York City. I would be stupid to drive there, it's a nightmare. Whenever I go to the city, I jump on a train to get there. In the city, most of the time I walk where I need to go but I've taken the subway a couple of times. 9. Are you happy with how you look? Why or why not? The last person I talked to was my boyfriend's mother. My boyfriend and I are long distance and he's with me right now so she was calling to see what we were doing. I love talking to her and I'm very close with her. I'm not around their house much which stinks. 11. What was the last book you read and would you recommend it? Beauty from pain by Georgia Cates. I would definitely recommend it. 1. Who inspires you the most? Why? 2. What is your dream job? Is it your job now? 3. What is your favorite song/artist? What makes you love them? 4. If you had to live in one place for the rest of your life, where would it be? 5. Have you ever been in love? What happened? 6. Favorite book genre. Why? 7. Would you rather read a book or watch a movie? 8. Favorite tv series. Why? 9. If you could have one super power for the day, what would it be? 10. Who was the last person you saw? 11. Do you have any regrets in your life? Why are they regrets? So... that was really fun! Thanks again for nominating me K. Nowinsky. I really do appreciate it! I hope you all enjoy the little interview with myself. I can't wait to see who else posts. Looking forward to all of the replies. Let me know if anyone wants to do guest posts or shout outs or anything like that. I am looking to broaden my reach. Always willing to help another blogger out. THANKS FOR READING!